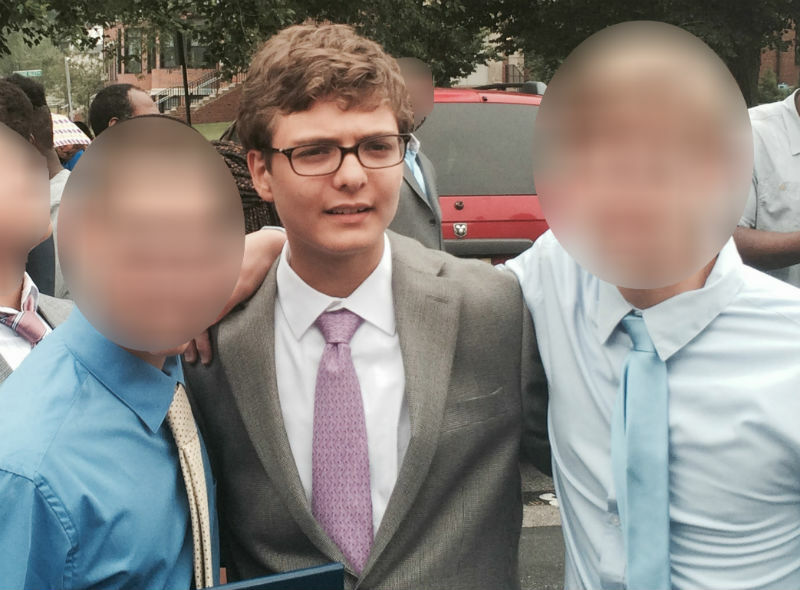 Ryan, with two of his good friends (faces blurred), after his eighth-grade graduation ceremony. Sometimes it seems like the only that is consistent about our autism journey is change. It’s an odd thing to call consistent, of course, but it’s true. While we focus on the present, we sometimes miss the bigger-picture changes that are happening right in front of our eyes. That is, until some milestone, event, or achievement makes them too obvious to miss. Ryan graduated from middle school last week. With honors. While the first part of that sentence is no surprise, the second perhaps is. But this is the year he truly learned to channel his energies and focus them on academics. He cared about his results, and when he didn’t understand a piece of material, he put in the extra time to master it. This was not a case of us pushing him. Ryan’s academic results come purely of his own making. We never had to push him to study, do extra work, or stay after school for extra help. That Ryan’s academic achievements came during a year of remarkable social growth is even more satisfying. This was a year that he developed close relationships with a core group of good friends, boys with whom he shares common interests. They hung out together at Friday night public skating sessions and Saturday night open hockey. They went to each others’ houses. They connected on social media. All of left Ryan feeling very positive about himself. This was also a year in which he felt so comfortable in his own skin that he addressed his classmates, of his own choosing, about autism. In the middle of all of it was an goal that felt like it would remain beyond Ryan’s grasp as recently as a few months ago — a scheduled three day, two night, eighth-grade trip to Washington, D.C. I made reference to it in a post earlier in the school year, when we decided (after learning they were refundable) to make payments for Ryan’s place on the trip despite our feeling that he likely would not attend. In fact, after I published that post, Veronica called me to ask if I was nuts. “Have you seen the agenda?” she asked. I had. And I had to admit that it didn’t look promising. It was full of visits to museums and historic sites, even a dance. There wasn’t much on it that Ryan would even agree to do with us, much less find appealing. True, Veronica did not sleep for the entire time he was gone. I was blissfully otherwise occupied traveling for work and so did not have to deal with the same minute-to-minute worry that she did. It wasn’t easy. Ryan broke his phone charger, meaning our lifeline to communicating with him wouldn’t last more than one day without assistance. In a series of phone calls and frantic texts, she arranged for him to get a new one remotely. He didn’t sleep much, the disruptions in his normal routine proving too great to overcome. But none of the kids did. It didn’t matter. Not to him, anyway. He had a great time. He even took part in the dance. And the accomplishments keep coming. This morning, on the first weekday of summer break, Veronica dropped Ryan off at the first of several weeks of hockey day camp he will attend this summer. He wanted to go a year ago, but we didn’t think he was ready. Not ready to handle a full day of multiple on-ice sessions and off-ice training. I told him as much last night. But he has worked so hard over the last year to improve his on-ice skills and his off-ice strength that I no longer have any such worries. He was nervous last night, but only the way that many of us are before starting something new. Two of his good friends (and teammates on the middle-school team) are at camp with him. I have a feeling he’s going to love it. I should have learned long ago never to doubt my son’s ability to accomplish something once he sets his mind to it. By now, I should know that the same things that can make other aspects of his life challenging — focus on a single thing, clinging tightly to repetition — benefit him in the pursuit of his goals. His body, not so long ago unable to manage a single pullup or full-toe pushup, now ripples with newly developed muscles in evidence of this fact. There are new obstacles on the horizon. High school. High school hockey. Whatever comes after. And some point, all of them can feel like they are beyond Ryan’s reach. But whatever challenges and sub-challenges arise, Ryan has proven — over and over again now — that he can handle them. That doesn’t mean we don’t or won’t worry. I’m not sure that will ever change. But the worry is different now. It’s tempered by the knowledge, reinforced through successive achievements, that whatever blocks his path, Ryan can knock it down, push it out of the way, or move right around of it to get where he wants to go. I kept waiting for a phone call from my sister saying I had to go to “Blank” to be with Ryan. Took my cell phone everywhere. I can’t wait to hear all the details from him. Your posts are inspiring. 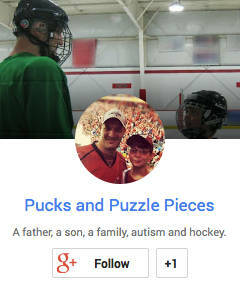 We are in the midst of the autism journey… And year 2 of the youth hockey journey. How do you keep Positive? Keep perspective? Our son LOVES hockey. It is by far his favorite thing. And such a social and physical benefit. But he struggles to keep pace with his team, but is too advanced for the special needs programs in our area. Constantly between 2 worlds. He likes to be challenged.., (give him the lust to check off) so we are going down the road of camps and private coaching, trying to keep him in the city program… It’s what he wants. But so stressful for us as parents when we see him have a terrible game due to lack of focus. Like everything on this journey we are questioning every decision. Did your son struggle with initial game play and his role in the ice? What helped?